It’s happening again, the British are invading Surry Hills! 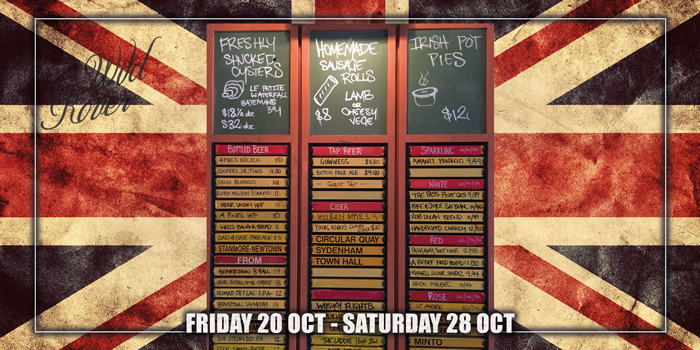 The Wild Rover train board menu will be filled with British beers on offer during SYDNEY BEER WEEK. Beavertown, Moor, Brewdog, Greene King, St Peters and Samuel Smiths will be featured among an army of British brands in a variety of styles. There will also be a variety of homemade Sydney Beer Week inspired pies throughout the nine days, made with a selection of our favourite beers. Come in, sit at the bar and work your way through the menu while tucking into your classic english pub grub. Stay tuned for this years beer selection.